Jinglepup is made from a fuzzy light brown material with a darker brown muzzle and paw pads. 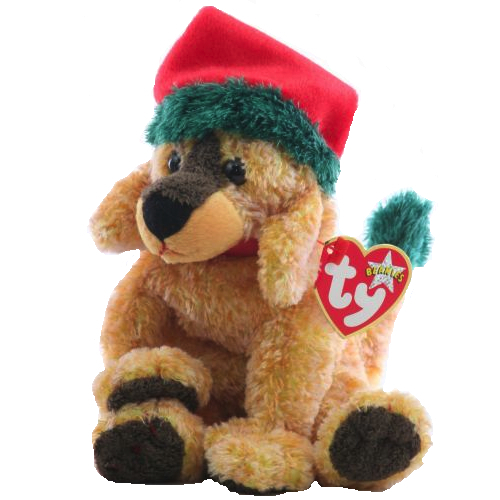 He has brown and black button eyes and a large brown nose with red stitching for his mouth. He wears a red Santa hat on his head with a white pom pom and a green furry trim. He wears a bright red collar around his neck and the tip on his tail is green. There are four versions of Jinglepup exclusive to different countries. The other three variations are exclusive to Canada (white hat trim and white tail), the USA (green hat trim and white tail) and Singapore (white hat trim and green tail).